As promised (or warned – however you’d like to think about it), here is the chicken dish that was the perfect accompaniment to the barley pilaf. Simple as simple can be (and so fast to prepare and cook! 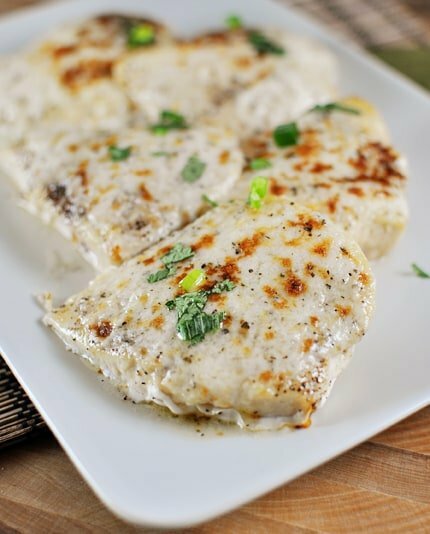 ), the chicken in this recipe is broiled lightly and then topped and broiled again with a creamy, delicious mixture made even more sultry and tasty with the addition of fresh lemon juice, Parmesan cheese and a few simple spices. 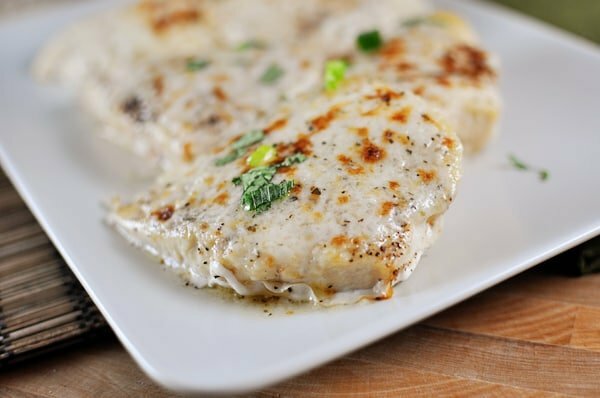 The resulting chicken is extremely juicy and tender and infused with all the bright, refreshing flavors of the Parmesan and lemon topping. If you haven’t become one yet with your broiler, I encourage you to do so. Using the piping hot broiler element will amplify the number of ways chicken can shine at dinnertime and as long as you keep a close eye while the chicken is broiling (now is not the time to start painting toenails, painting bedroom walls, or painting watercolors with your children, catch my drift?) and ensure it doesn’t overcook, success can be yours. Welcome another quick and delicious weeknight chicken dinner into your rotation! Preheat your oven's broiler. Grease a broiling pan or line a baking sheet with aluminum foil and lightly coat with cooking spray. In a small bowl, mix together the Parmesan cheese, butter, mayonnaise and lemon juice. Stir in the dried basil, pepper, salt, onion powder and garlic powder. Mix well and set aside. Arrange the chicken breasts in a single layer on the prepared pan. Lightly season each side of the chicken with salt and pepper. Broil a few inches from the broiler element for 4-5 minutes. Flip the chicken over and broil for a 3-4 more minutes, until mostly cooked through. 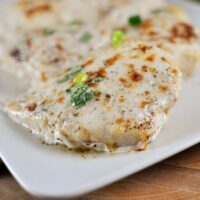 Remove the baking sheet from the oven and spread an equal amount of the Parmesan mixture over the top of each chicken breast. Broil for another 2-3 minutes until the topping is golden and bubbly and the chicken is completely cooked through. Serve. If the chicken breasts I am using are on the thicker side, I like to slice them lengthwise to form two thinner chicken cutlets. It helps the flavor infuse into every bite and they cook more evenly. We’ve had this several times and love it with roasted broccoli. Thanks for another wonderful recipe! I’ve never actually left a comment on here but I am an avid user of everything “mel!” In fact my kids are on a first name basis with you-I often hear “Is this one from Mel?” We had this chicken tonight and as my daughter was clearing the table and putting the leftover chicken in a tupperware we hear her mutter, “Mmm, this is so good. How does Mel do it?” I don’t know how I would do meals without you! Thanks a million for all your amazing recipes and ideas. The lemon sauce on top of these is to die for. I made this a few weeks back and can’t get the taste out of my mouth. Making it again tonight. It’s so simple and easy!!! Wow. I wasn’t expecting it to be that amazing. It looked pretty and was quick, and that was all I was hoping for. It was so good! I thought it would be bland with the only flavor sitting right on top, and I was afraid it would be like eating boiled chicken, but it was so flavorful and delicious. Even my picky non-meat eater loved it. I served it with garlic rice pilaf and sautéed zucchini and yellow squash. Thank you for a new favorite meal! This is one of my favorites! I like to put it on a bed of brown rice and drizzle extra sauce over the rice. Sometimes when I’m too lazy to use my broiler or there are too many things going on to really pay it the attention it needs I just cook the chicken on the stovetop and then put the sauce on top at the end to heat it through. It doesn’t get that nice golden brown color but it’s still delicious! Thanks for this one Mel! I am not a huge chicken fan, but this will definitely be in the rotation now! I subbed asiago for part of the parmesan, and it was excellent. Thank you for all your fantastic recipes. I bookmarked this back when you originally posted it and I just got around to making it. It was fantastic! Thanks! Made this tonight and it was wonderful! I have the pickiest eaters in my family but there were no leftovers after dinner. I tweeked it a tiny bit to go along with Weight Watchers, but with brown rice and zucchini…perfect!!! I did not physically lick the pan, but I did run a spoon through it repeatedly so as to not waste a single drop of that sauce. I highly suggest just dumping all of the sauce on. It does melt off, but the result is amazing. This would also be delicious on fish. We will be having this frequently. Made this tonight for dinner and it was sooooo good! I always seem to avoid my broil setting since 99.9% of the time, whatever I broil (aka, burn) ends up not being edible. But I stayed glued to the oven this time and although the smoke alarm went off twice (maybe it’s just too sensitive? ), I finally had a broiling success. Thanks for a great recipe! Another winner from Mel! So tasty, fast and easy! Not to mention I had everything on hand! Thank you for saving dinner yet again! Plus it came together so fast and easy, it was ridiculous! My new favorite!!! My husband couldn’t quit eating it (let’s be honest, I couldn’t either) and when he finally got around to saying something other than how delicious it was, he asked, “Where did you get…. (slight pause)” And then before I could say anything, he said, “Oh, duh…it’s from Mel.” And then went back to eating his piece. It made me laugh. You are very well known in this house! Thanks! My parents and husband scarfed this down! Dad and husband both thought I put too much on their plates, and ended up eating it entirely. The chicken was cooked to perfection under the broiler, something I’d never thought to do before. It turned out perfectly juicy and tender, and the sauce on top is lick-the-plate delicious. Great one!! Mel- this was fantastic! I cut my chicken breasts lengthwise, and used a laughing cow wedge instead of the mayo. The flavors were so delicious, and the chicken was so moist. It’s a good thing I was watching it though… I almost had a flame up! Thankfully only a little of the drips burned. As with all of your recipes- this one will be made again. Thanks! Just had this for dinner. SO GOOD. Thanks again, Mel! This was a great weeknight meal that I was able to prepare in a flash! My husband loved the chicken and we were able to re purpose the leftovers in chicken tacos. Yum! Thanks for a keeper! I made this for dinner last night and it was great! The chicken had a lot of flavor and was so quick and easy to put together. The only change I made was I omitted the mayo and used two wedges of garlic herb laughing cow cheese instead. I also had thicker chicken breasts so I had to cook them a few additional minutes on each side but they also browned up a bit more which was nice. This is the second recipe from your site I’ve tried (so far…there are so many I’ve bookmarked) and it was another hit! So quick and easy to put together, I had dinner on the table in no time, which was great after a long day. The chicken stayed so juicy! I’ve actually used a method similar to this on fish (without the cheese) with success also. Looking forward to working my way through more of your recipes…thanks! This has become a family favorite at our house! I love that all of the ingredients are staples for me. I serve it with the Pioneer Woman’s Baked Lemon Pasta and oven roasted broccoli…SO delicious! This was right up my alley – ingredients I keep on hand, easy, inexpensive, and very tasty! I overcooked the chicken a bit, so I’ll cut down the cooking time next time. There will definitely be a next time, this is a keeper! I am always looking for new chicken recipes! I have used the parmesan/mayo and garlic or other herbs combo on garlic bread as well as fish. I haven’t done it on chicken, but no reason not to expect the same great results. When I did it on the fish I also sprinkled a thin layer of italian seasoned breadcrumbs on top. Made this the other week as a quick dinner idea and my boyfriend talked about it all week. Thanks again! we had this for dinner tonight and it’s fabulous! Thanks for another winner! This will be in regular rotation at my house! I served it last night to rave reviews. A word of advice if I may? I tried to save on dirty dishes by broiling the chicken in a casserole/serving dish instead of a baking sheet. Quite a bit of moisture accumulated at the bottom of the dish and I guess I should have poured it off, but I didn’t. As a result the sauce was a bit runny. Not that the kids were complaining, they just poured it over their rice. Loved this! The chicken was really tender and flavorful. I made this last week for my husband and we both loved it! I even used the margarine from a tub instead of butter. This is definitely going into rotation! I just made this (with the baked brown rice – perfect!) and it was delicious! The lemon really makes it shine. Random question – I grew up using bottled lemon juice, not knowing how amazingly superior fresh is. I have a semi-old bottle lying around… is there anything good to do with bottled lemon juice? I just made this tonight for my father who proclaimed, “This is the best chicken I’ve ever had!” so definitely a keeper. Thanks for another winner! Tried this one last night and it was a big hit!! I love that it was simple yet Yummy!!!! I made this last night for dinner and was super yummy and easy and the hubs loved it!! I love all your recipes that you post. Thanks for sharing!! Looks and reads yummily. A must make recipe. Just made this tonight. So easy and so delicious! And I even copped out on my needed grocery trip and used walmart Parmesan and bottled lemon juice. Still super tastey! Thanks for all the great recipes! I can’t wait to try this. I’m always so hesitant to use my oven in the hot midwestern summer but this is so fast I think I could get away with it before my husband starts complaining. Speed is the name of the game 🙂 Definitely going to try this soon! Oh my goodness. There were RAVES at the table tonight. Great recipe! We really enjoyed the Barley Pilaf with it as well. I thought this recipe looked familiar! I’ve made the tilapia version several times, and it is deeeelish. I’m definitely going to try it with chicken. Thanks for the great idea! This recipe is great with chicken or tilapia. I substituted Laughing Cow cheese for the mayo and liked it even better, but either way, it’s a hit at my house! Oh, I’ve made that tilapia recipe (on my site) but never thought to adapt it to chicken. Good going, Mel–I’m on it. I know in advance that it’s a winner! I really appreciate how you post real food that real people actually want to make and eat. I am immediately turned off when I see some of the weird lists of ingredients and combos that bloggers come up with. Kristin – I always broil on high but that’s just my preference. You may need to experiment with your oven – some broiler settings may be much hotter than mine. If you use high, err on the side of placing your oven rack at least six inches away from the broiler element instead of having it only 2-3 inches away. My broiler has two settings, low and high. Which one is appropriate for this recipe? Wow. . . Never would’ve thought to make Parmesan Chicken with this technique. Interesting! Think I’ll Experiment with this Technique with another type of chicken dish I develop. Thanks! This looks amazing, Melanie! I need to become one with my broiler, as I don’t use it very often. I can’t wait to try this recipe!